This weekend, Wire played their only UK show of the year, as part of the Futuresonic festival in Manchester. 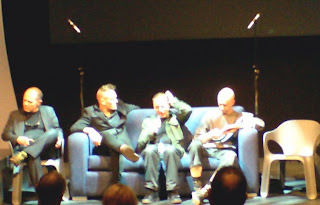 The evening began at the Contact Theatre where the band were interviewed on a sofa by legendary punk journalist John Robb, who is still sporting the same hairstyle that he's had for the past 25 years. The first thing I noticed as the band walked onstage was that Bruce Gilbert was missing. There was an extra chair laid out so I assumed they were expecting him to turn up later. If I'd bothered to check the band's website recently then I would have known that he only made minimal contributions to the recent EP and has now quit the band. The interview seemed disorganised and also a little awkward. There was only one microphone, which was passed between band members until they decided they could manage without it, and Robb did not seem to have planned enough questions to fill the allocated time. The band seemed like they would rather not have been there. Colin was fairly relaxed and did most of the talking, Robert said nothing for most of the conversation until the interviewer directly asked him a question. Graham looked tired (he explained that they had come straight from the soundcheck) and at one point appeared to have fallen asleep. He was also very irritable and responded aggressively to some of the questions, in particular he tore Robb to shreds when it was suggested that the "Pink Flag" album had a typical punk sound. I wasn't sure if this was just down to tiredness; it almost seemed that there was some long-standing tension between the two parties. However, in one of his calmer moments, Graham did mention that he felt sad to be back in Manchester and not be able to meet up with Tony Wilson. Partway through the interview, an audience member interrupted with a question. I don't think Robb had intended for there to be audience participation but he soon realised that this could rescue him as he was rapidly running out of questions of his own, so he opened the session up to the crowd. Inevitably, someone asked about Bruce and the response from the band was a little cagey. They explained that he no longer wanted to tour but it seemed there may be more to his departure than they were telling us. They were also asked for their views on Britpop and I was pleased to discover that they seem to dislike that period in music history nearly as much as I do. Unfortunately Robb soon decided that we were out of time so I never got to ask my question. After a quick bite to eat at the Deaf Insitute (which sadly does not cater specifically for deaf customers; it just takes its name from the charity that inhabited the building before it was turned into a bar) we headed to the Academy for the evening's main entertainment. By this stage I was starting to worry about how well the band would work without Bruce, and also whether Graham could stay awake until 10.30 when their set was due to begin. I noticed a laptop near the front of the stage so I started to suspect that they were replacing Bruce with electronic sounds. However, when the band took to the stage I discovered that they had drafted in Margaret Fiedler (from Moonshake/Laika) as a replacement. The laptop did not appear to be used at all. It was a very guitar-driven set with no discernible electronic elements so I can only assume that the screen was displaying the lyrics in case Colin forgot them. Although the band gave an impressive performance, the show suffered from poor sound quality for the first half. By the end, things seemed to have improved slightly but this may just have been because we had grown accustomed to the distortion, or perhaps the band were deliberately playing more aggressively to distract us from it. The structure of the show was also rather strange. The band played for about 30 minutes, concentrating mainly on "Send"/"Read and Burn" material with one, I think, or possibly two new songs. "Being Sucked In Again" was the only 1970s song played during the main part of the show. Colin handled most of the vocals, with Graham taking over for the most aggressive version of "Agfers of Kodack" that I've heard them play. His delivery suggested that he was still seething from the earlier encounter with John Robb. After leaving us wondering if they only had enough energy to play for 30 minutes, the band returned for three encores, which consisted of "Boiling Boy" and a host of "Pink Flag"/"154" songs, including "The 15th", "Lowdown", "12XU" (so frantic it was nearly over before I realised what it was) before ending with "Pink Flag" itself. Although I didn't get the same buzz from this show that I got the last time I saw them back in 2000 (when the sound was better and the set was more varied), it was apparent that Wire have written some of the best material to come out of the UK in the last 30 years and they can still put on a better performance than most of today's young bands. btw what was the question you wanted to ask? John Moore (Mary Chain, Black Box Recorder) does a splendid blog (http://blogs.guardian.co.uk/arts/author/john_moore/) which I can thoroughly relate to as someone staring at the back end of 40 very hard.